Passwords need to be a minimum of 6 characters. For security try and use a mix of letters and numbers. NEVER use a simple 123456 or just a first name. 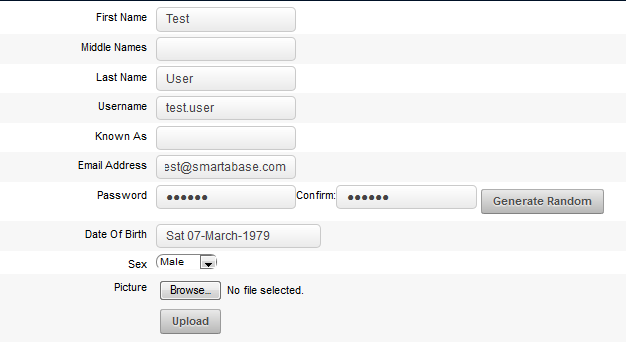 For security, passwords do NOT appear once they are written in. They cannot be read/accessed once they are set. -Date Of Birth: Use the << arrows to move between years and the < to move between months to select the correct date using the pop-up calendar. Move to the correct date and then right mouse click on the correct day. -Phone Number: Phone numbers are used for text messages. 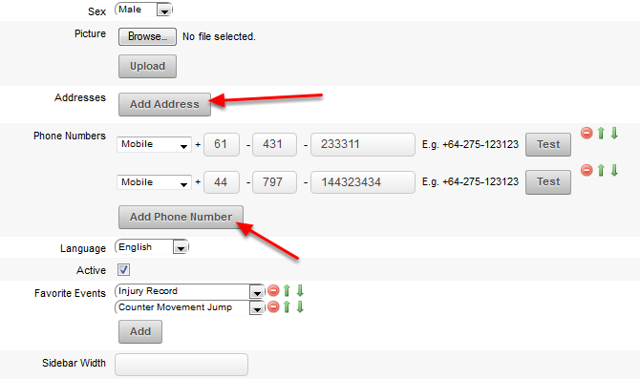 Phone numbers need to be entered as International, National (drop the 0) and then Local Number. For example, (03) 453 2768 becomes 643 453 2768, or a cell phone 0275663 877 becomes 642 756 63877. Once you write in your cell phone number, you can click on the "test" button and the system will send a text message to that phone number to verify it is correct. A notification will also appear saying "valid phone number". If it doesn't then try again. YOu can add multiple phone numbers by clicking the "Add Phone Number"
Internationalisation... what language will appear when you login? Favourite Events: These are events that you can choose to appear as a separate button at the top of the Home Page, and that event appears at the top of the list in the sidebar, as well as having links to it by the athlete's picture on the sidebar and on the Sidebar that always show. Usually you would select an event that is used daily, but you do not have to select any events (see the next lesson to learn more about favourite events).